Peavey announces ReValver MK III: amplifier modelling software in stand-alone or plug-in formats, compatible with all VST/AU based systems. 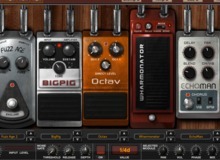 Native Instruments announces the release of Guitar Rig 3.1, a free software update for its digital guitar studio. The new version offers optimized high-precision modeling for improved sound quality as well as several usability enhancements. IK Multimedia has announced its new "Plug & Mix Madness" promotion that lasts through April 30th 2008.